ZTC employs highly skilled and experienced professionals who specialize in designing prefabricated wood buildings. ZTC house construction projects are developed in SEMA software. The software is the world leader in the production of timber construction software. Wood house designing in this way allows to provide a visualization of the building in every step of the design process. Wood pieces are precisely cut from a production file with a CNC speedcutter. Production designs of each panel follow it through the production process to ensure precision, quality, accountability and control. ZTC has over 25 years of experience in wooden house prefabrication and construction. Our team of professionals develop the elements of each building with accuracy and responsibility, ensuring high quality according to all customer’s requirements. ZTC owns a factory specifically adapted to the production process of wood panel structures that ensures not only the high quality of products but the possibility to offer competitive prices and production capacity. Experience gained through years of work in the field of wood building construction and developed production technology allows us to realize any technical solution of panels without significant restriction. 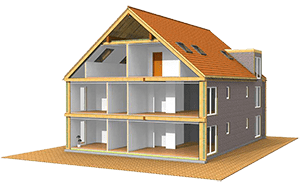 In building a house from wood panels the major amount of work – the production of elements of the building such as wall, ceiling and roof building components are prefabricated according to a precise project in a controlled environment – the production factory. The building components therefore are not affected by the elements – rain, snow and frost, therefore the use of preservatives is not necessary which makes panelized buildings more environmentally friendly and ecological. Find out more about the prefabrication process! ZTC can ensure that the full spectrum of finishing works and services are carried out in the project. Timber frame panel houses are environmentally friendly because they effectively combining quality natural materials with the latest scientific advances in construction. Wood house designing according to latest construction technology has achieved the optimal balance between thermal insulation and breathability which is beneficial to the health of residents of the building.